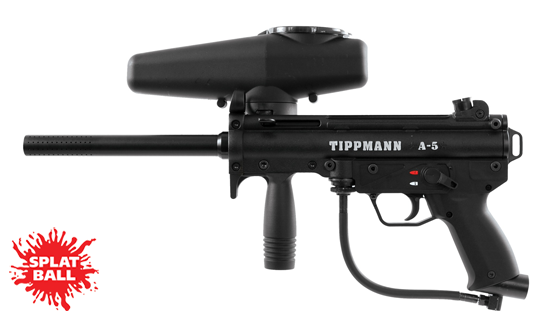 The Tippmann Paintball A5 paintball gun is one of our store’s best sellers. We’ve sold countless A5’s to paintball players all over Minnesota. When it comes to durability, customization, and easy of maintenance, the Tippmann A5 is hard to beat. One of the best features of the Tippmann A5 is the Cyclone feed system. The Cyclone is a pneumatically driven feed system which loads paintballs into the gun quickly and efficiently. Its unique pneumatic drive system uses no batteries. We use these markers as upgrade guns at our paintball fields. The Tippmann Paintball A-5 is the most popular scenario marker ever produced. The A-5 features a durable aluminum body, inline bolt system, front and rear sling mounts, low profile hopper and 8.5” high performance ported barrel. It is easy to upgrade to the three position E-grip selector switch kit, Response Trigger or the Flatline barrel. The A-5 is known for its ability to be customized with many aftermarket accessories and features Tippmann’s World Class 2-year Warranty.